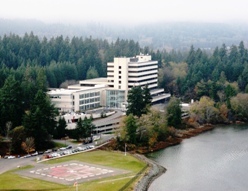 Naval Hospital Bremerton (NHB) is a community-based acute care and obstetrical hospital, offering expert primary care, emergency care and a broad range of medical and surgical specialties, with 36 inpatient beds (with expansion capacity to 72+). The hospital is conveniently located between Naval Base Kitsap (NBK) Bremerton and NBK Bangor. NHB is parent command for three Naval Branch Health Clinics and the Puget Sound Family Medicine Residency Program. The three clinics are located at Puget Sound Naval Shipyard, NBK Bangor and Naval Station Everett. Welcome to Naval Hospital Bremerton.